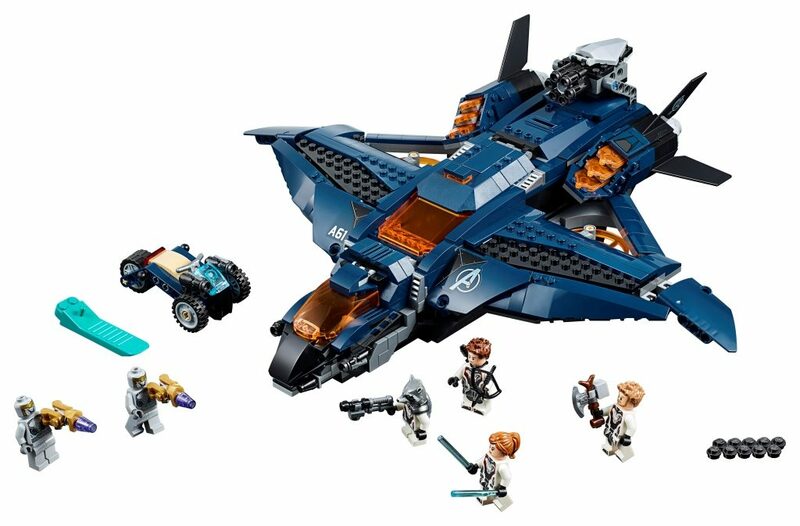 With just under a month to go until the release of Avengers Endgame The LEGO Group has revealed five new construction sets. 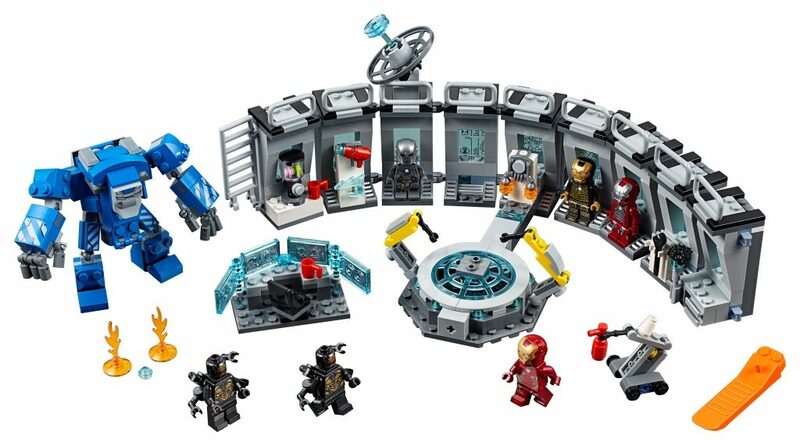 The sets which are available today include a War Machine Buster mech, an Ultimate Quinjet, and Iron Man’s Hall of Armor. 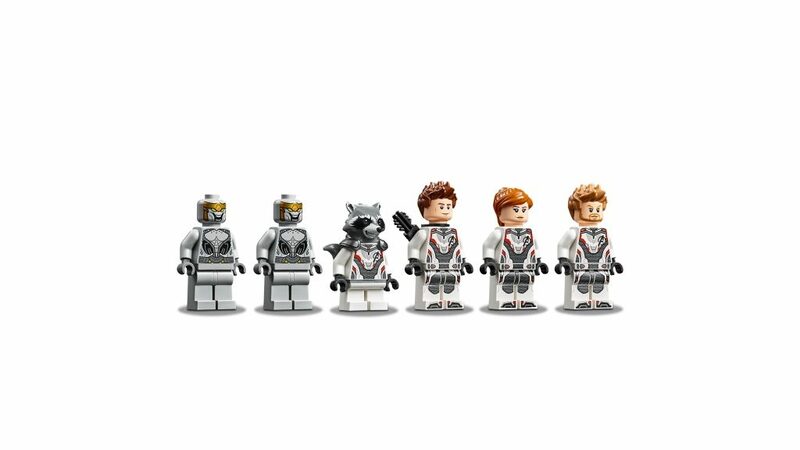 I almost didn’t want to look at the products in case of any spoilers but my love of LEGO can not be denied. Check out some of the details of the sets below! 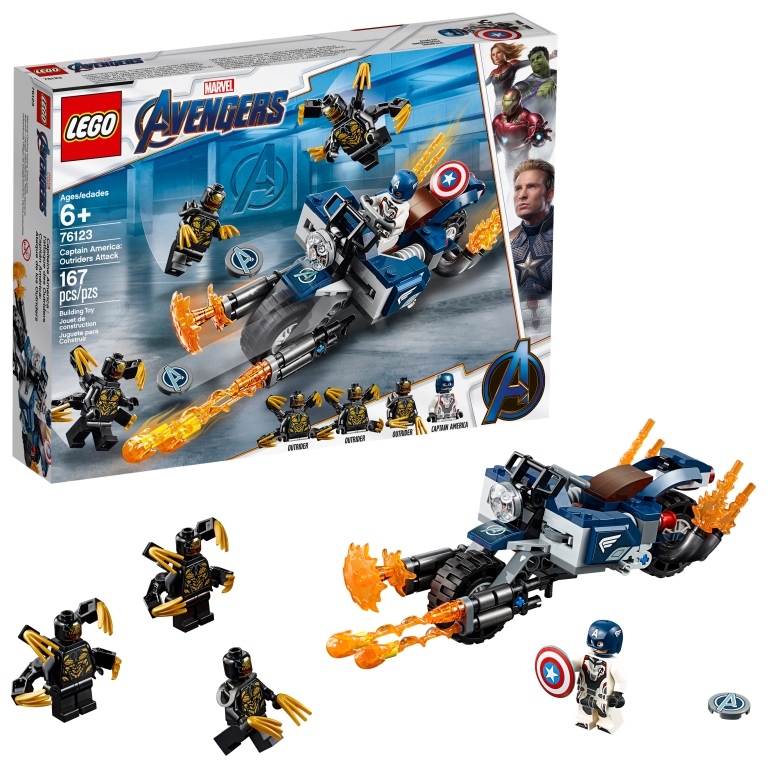 Take on 3 Outriders with Captain America’s bike which features a minifigure cockpit, 2 Captain America shield shooters, fold-down bike stand, headlight element and an exhaust flame element. Fight back with the Captain America shield shooters. Then jump out of the cockpit, detach the blasters, and battle those enemy Outriders one on one! 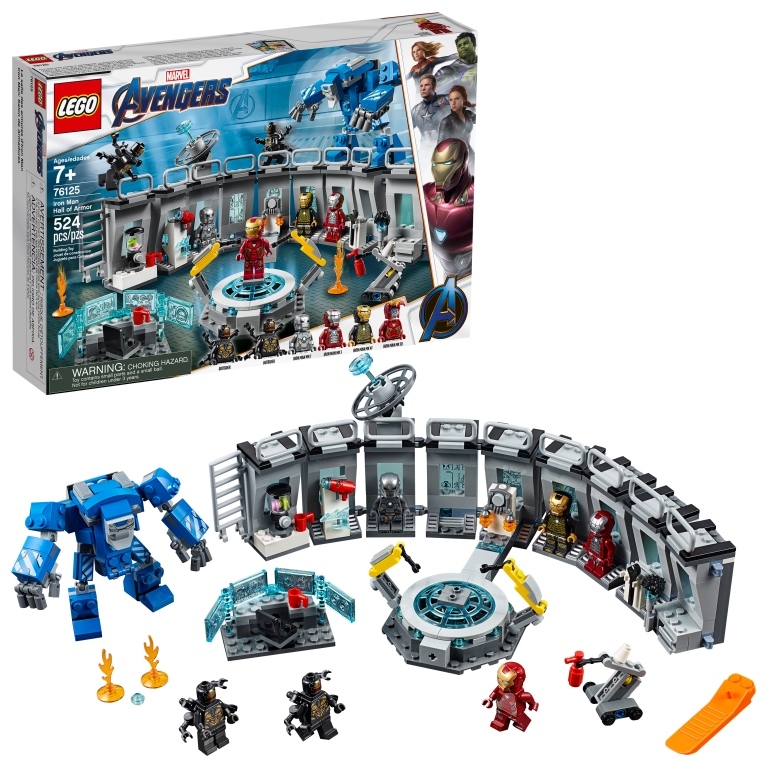 The set includes 4 Marvel Universe minifigures: Captain America and 3 Outriders. 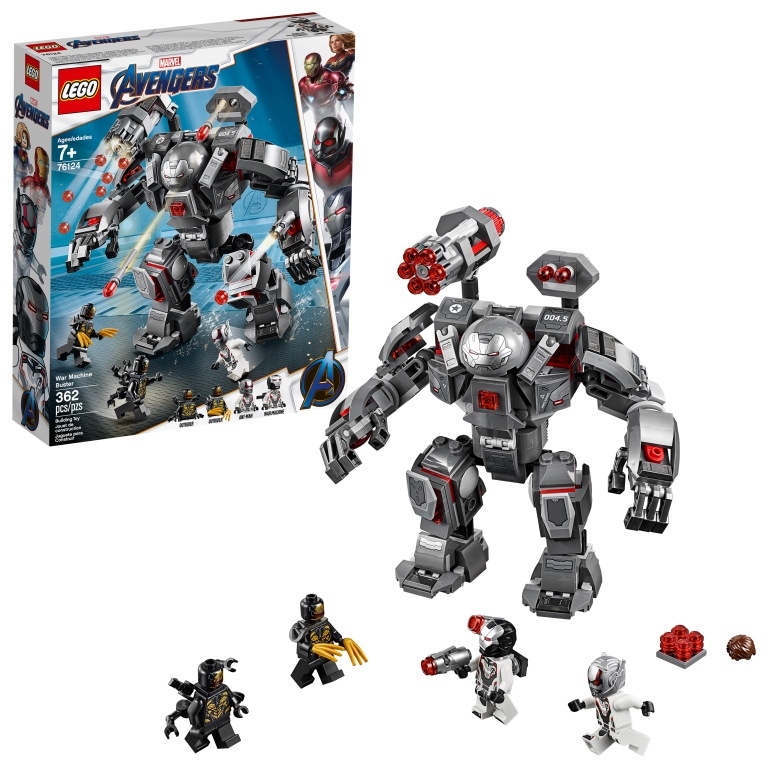 War Machine Buster features an opening minifigure cockpit, 6-stud rapid shooter, 2 detachable stud-shooting cannons, 2 flick missiles, posable arms and legs, gripping hands and an opening storage compartment for extra ammo! Then detach the stud-shooting cannons and battle the enemy on the ground with War Machine! 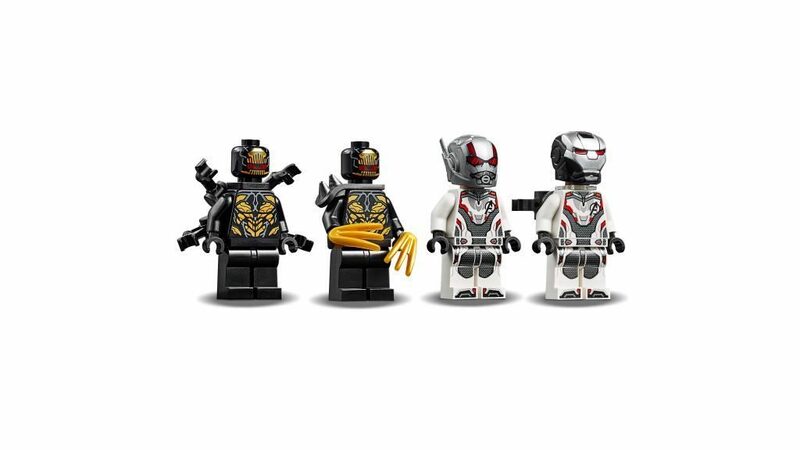 Set includes 4 Marvel Universe minifigures: War Machine, Ant-Man and 2 Outriders. Join Tony Stark in the Iron Man Hall of Armor and experiment with new tech! Make a smoothie in the kitchen. Work at the desk and get suited up on the rotating podium using the two posable robotic arms. 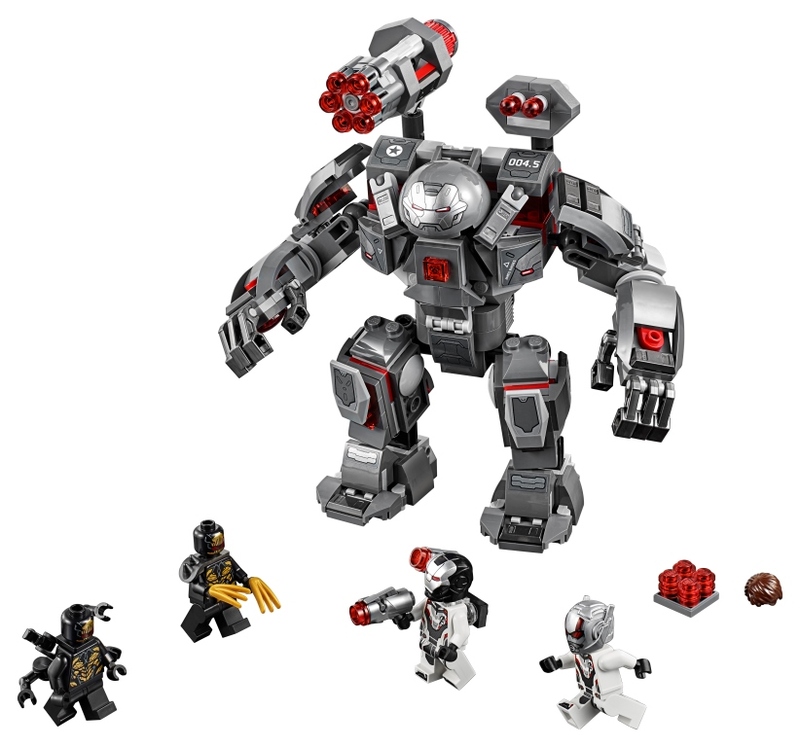 Lift heavy objects in the Iron Man lab wearing the massive Igor Suit with an opening minifigure cockpit and posable arms and legs. And if your experiments go wrong, get the robot to put out fires with the fire extinguisher. 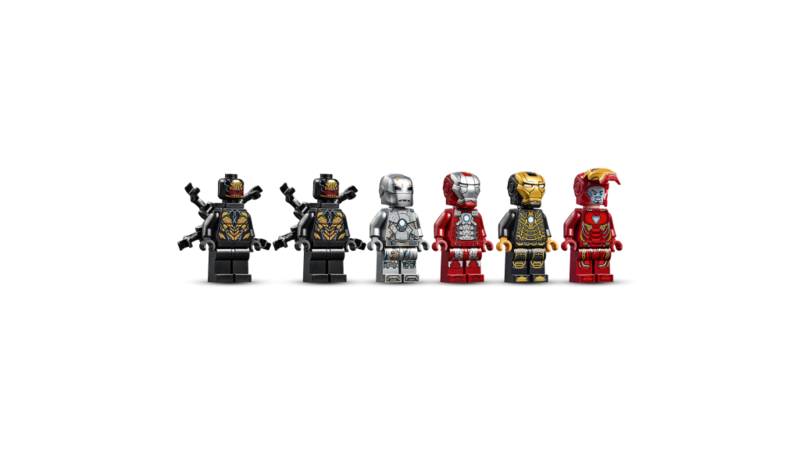 The Iron Man lab features detachable modules that can be combined and stacked in many different ways and the set features 5 Marvel Universe minifigures: Iron Man MK 1, Iron Man MK 5, Iron Man MK 41, Iron Man MK 50 and an Outrider. Prepare the weapons with Rocket and Thor in the passenger compartment. Jump in the cockpit with Black Widow and take off. Fire the stud shooters and the 6-stud rapid shooter. Make a smooth landing and continue the fight on the wings. Then surprise the enemy with the stud-shooting trike! 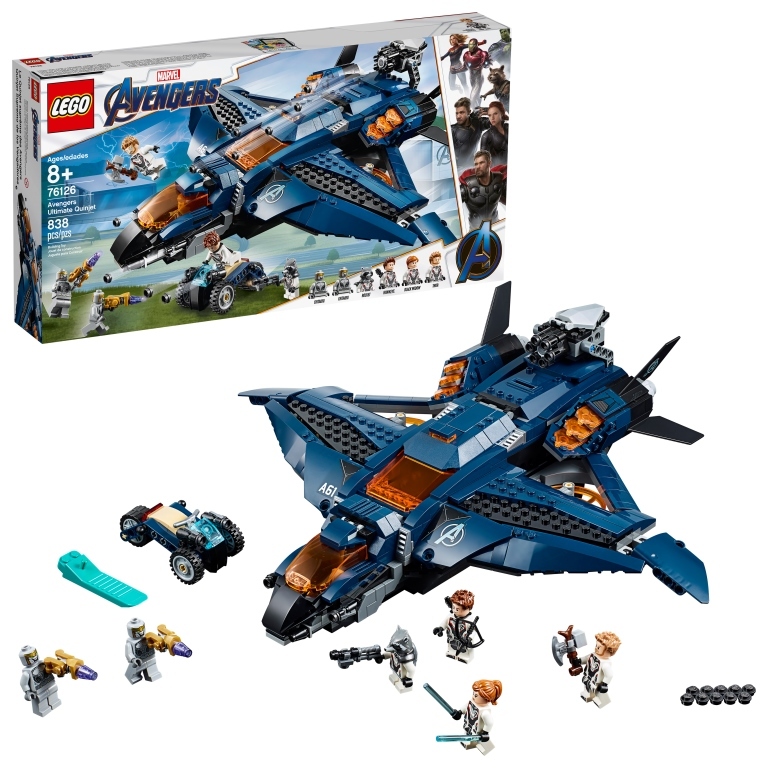 The Marvel Ultimate Quinjet model features an opening minifigure cockpit, 2 stud shooters, opening passenger compartment with 2 minifigure seats and weapon racks, opening rear compartment with fold-out 6-stud rapid shooter and trike, adjustable wings and spinning rotors and includes 6 Marvel Universe minifigures: Black Widow, Hawkeye, Rocket, Thor and 2 Chitauri. 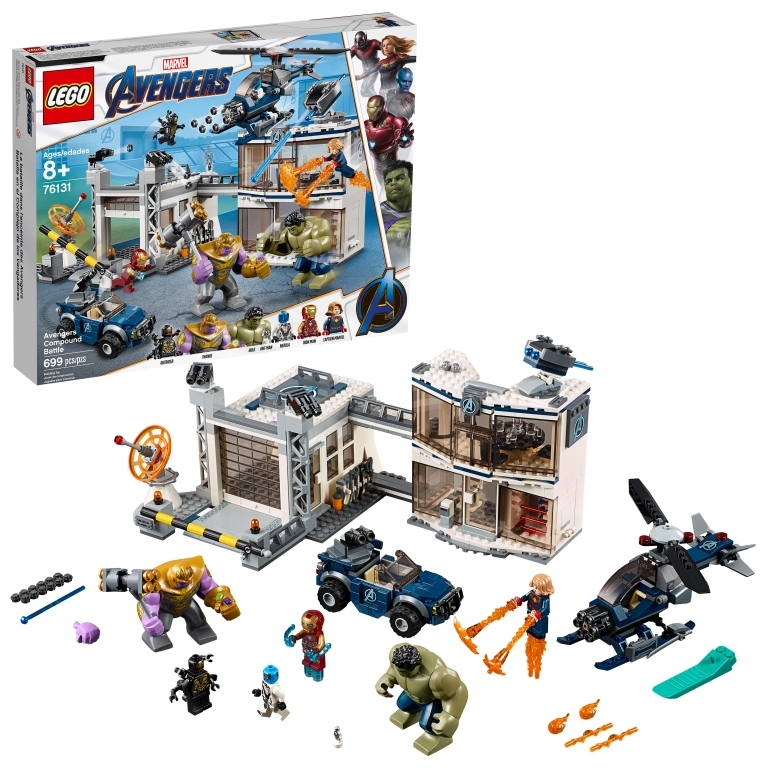 Team up with Iron Man, Captain Marvel, Hulk, Nebula and Ant-Man and defend the Avengers’ compound! 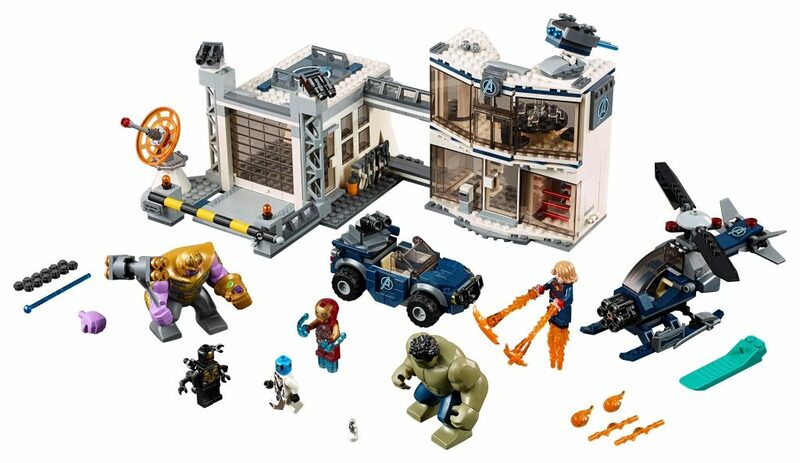 This set features the Avengers compound with a 2-level office building, helipad, garage, plus a helicopter and offroader for creative play. Make plans in the office and grab weapons from the table’s secret compartment. Monitor Thanos and the Outrider’s approach to the Avengers HQ with the radar, then speed into action. Activate the rooftop defense system. Target the Outrider with the offroader’s dual stud shooter, then launch the Avengers’ helicopter and fire its rapid shooter! 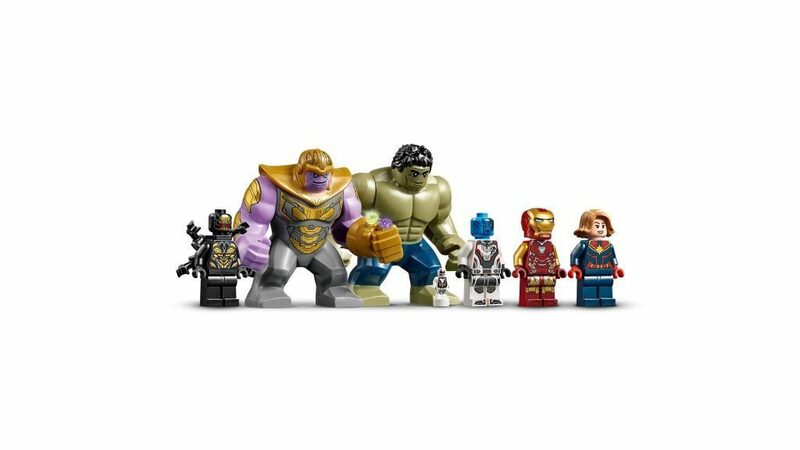 The set also includes 4 Marvel Universe minifigures: Iron Man, Captain Marvel, Nebula and a 4-armed Outrider, plus posable Hulk and Thanos big figures and an Ant-Man microfigure.